Hi, I‘ve changed my location to Erfurt, DE and the display shows a time 8 hours in future but in the correct timezone (CEST). // values in metric or imperial system? Are you using the latest version of the code? 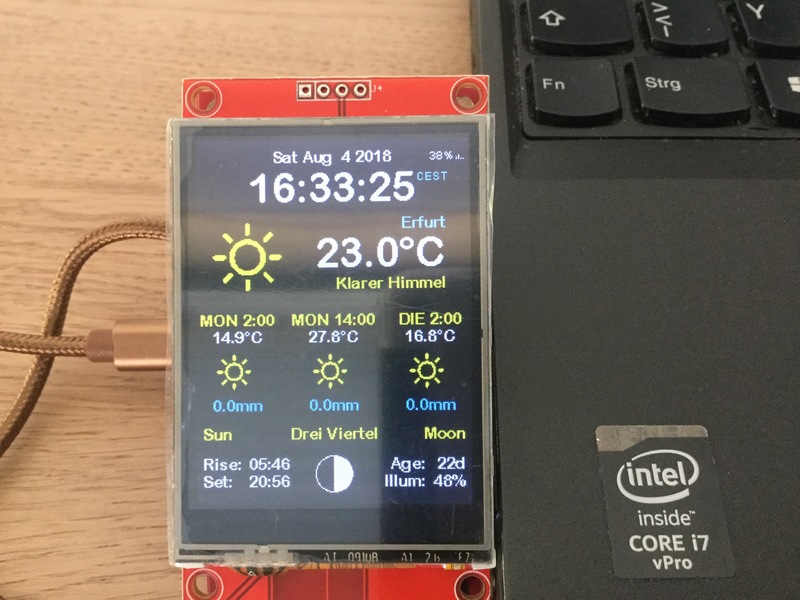 Can you please attach a photo of the display and the `settings.h` (mask WiFi settings and OWM API key). Sorry, can't reproduce this here with the latest version of the app (we're now using `OPEN_WEATHER_MAP_LOCATION_ID` instead of `OPEN_WEATHER_MAP_LOCATION`). Maybe the serial console would reveal some more secrets like e.g. a failed NTP sync? I found the reason for the wrong time .... quite surprising .... I did some basic tests using the sample code of the library used by you and it returned a similar value - so it had to do with my environment. Some additional tests showed a weiter behavior of the guest wlan I be used - in particular it returned a wrong timestamp for NTP requests. After changing the hotspot everything worked as expected. Sorry for using your time.